Having swiftly secured Greece, Alexander was finally able to make final preparations for his Great Crusade against Persia and its empire, which stretched from the borders of Greece across to Afghanistan, and from Scythia down to Nubia, the largest the world had ever known. After celebrating traditional games at Aegae and offering appropriate sacrifices to the gods, Alexander was ready to move early in 334 bce, despite the face that the army remained unpaid as the Treasury inherited from Philip contained less than 16 talents and had debts in excess of 500! Plutarch states that before he set out, Alexander insisted on finding out the exact financial circumstances of his companions, offering each of them part of his own wealth. When Perdiccas asked him what he was leaving for himself, Alexander replied, “My hopes”, whereupon Perdiccas and several others declined anything other than to share them with him. Nevertheless, Alexander’s supplies would only last thirty days, so he needed to engage the Persian army as soon as both the conditions and the omens were in his favour. 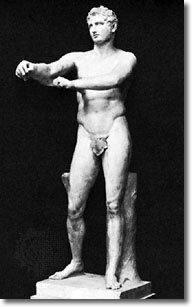 When condensation on a wooden statute of Orpheus was mistaken for sweat, consternation was averted by the soothsayer Aristander, who confidently stated that it signified Alexander would “perform deeds which would live in song and story, causing poets and musicians to work hard to do them justice”. 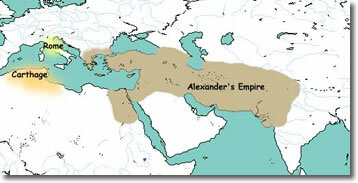 In the spring of 334 bce Alexander set out east towards the Hellespont, leaving Antipater as his regent with 12,000 infantry and 1,500 cavalry at his disposal whilst he took with him a combined allied force of 40,000 infantry and 6,000 cavalry. Proceeding towards Amphipolis they crossed the River Styrmon and passed Mount Pangaeum to Abdera and Maroneia, crossing the River Hebrus and marching through Paetica, crossing the River Melas and reaching Sestus within 20 days. On arrival at Elaeus at the tip of the Gallipoli peninsula, Alexander sacrificed to Protesilaus the first Greek soldier to set foot upon Asian soil en route to the Trojan Wars. The major task of taking his infantry, cavalry and large entourage across the Hellespont and from Europe into Asia was entrusted to Parmenio, using 160 triremes and a large number of merchant ships. Whilst crossing the waters Alexander sacrificed a bull to Poseidon and poured wine to appease the Nereids (see nymphs) and, first to land, he leapt down from the ship in full armour, hurling his spear ashore and declaring Asia spear-won land. Little did he know he would never set foot on European soil again. After setting up altars to Zeus, Athena and Herakles at the landing site, he set off toward Troy to fulfil his lifetime ambition. Upon arrival he offered further sacrifices to Athena as patron goddess of the city, and exchanged his own armour for that purportedly used in the Trojan wars and displayed in the temple, which ever after was carried into battle by his bodyguards. Then he poured libations to the Greek heroes, and at the tomb of his ancestor Achilles anointed the site with sacred oil. Laying a wreath on the grave, his companion Hephaestion did likewise at the grave of Patroclus, with a final sacrifice made to the luckless Trojan king Priam to avert his anger. In May he set out to join the main body of the allied forces to the north at Arisbe, and following the inspection of his troops gave orders to march in battle formation east towards the River Granicus, where the Persian army were waiting for them under the command of the aristocrats Arsames, Rheomithres, Petines and Niphates, together with Spithridates, Satrap of Lydia and Ionia, Arsites (the governor of Northern Phrygia) and Memnon of Rhodes, commander of 15,000 Greek mercenaries fully familiar with Alexander and his capabilities. At their Council of War the Persians rejected Memnon’s suggestion of a scorched earth policy to deprive Alexander of supplies, and instead decided to stay and fight on the eastern banks of the River Granicus. Receiving reports from his reconnaissance troops that the Persians had formed their battle positions on the steep banks of the swirling waters, Parmenio spoke against an assault in such difficult terrain. For the first time Alexander rejected his advice, and simply answered that, having crossed the Hellespont, he would be ashamed of himself “if a little trickle of water like this were too much”. He knew that any delay would give the Persians confidence, and was determined to cross the river. Although Plutarch says he simply plunged in at the head of 13 squadrons of cavalry, Diodorus gives a more credible version in which Alexander took his infantry downstream and crossed by cover of darkness before the enemy released what was happening. Parmenio was sent to take command of the army’s left wing with his son Philotas on the far right, with Alexander taking the royal position at the head of the Companion Cavalry. Ranged against them were 20,000 Persian cavalry and nearly the same number of foreign mercenaries on foot. However, in their over-confidence the Persians had made an error of judgment, drawing up battles lines in which the mercenary infantry did not take the front line. This meant the cavalry would have to fight infantry-style in hand-to-hand combat against their battle-hardened Macedonian counterparts led by Alexander himself, resplendent in his shining armour and conspicuous double white-plumed helmet. The Persian cavalry’s sole aim was to take Alexander dead or alive, and in strengthening their left wing to oppose his position on the right they weakened their centre. Following an initial silence in which both sides watched each other across the river, Alexander launched the attack to the sound of trumpets and resounding battle cries. Despite heavy casualties in the swift current, the scout cavalry under Amyntas managed to pin the Persian left wing down, whereupon Alexander led the Companions into the left centre of the enemy. After fierce fighting the Macedonians managed to force their way up the steep muddy banks and out onto even ground, where the Macedonians’ strict adherence to their battle plan won the day, the Macedonian sarissa proving more than a match for the Persian lance. In the midst of furious hand-to-hand combat with the Persian elite, Alexander killed Darius’ son-in-law Mithridates, striking him the face with his spear, whereupon the Persian nobleman Rhoesaces dazed Alexander with a blow to the head which sliced off one of the white helmet plumes. As he speared Rhoesaces right through his breastplate, the Persian Spithridates was about to attack Alexander from the Back, but as he raised his scimitar his arm was sliced off by the ever-watchful Black Cleitus who saved Alexander’s life. With reinforcements having managed to fight their way out of the river and up the bank, the Macedonians were now fighting on equal terms and soon the Persians were routed. Although Plutarch and Arrian state that the Macedonians lost relatively few men (the 25 Companions who fell were immortalised in bronze by Alexander’s sculptor Lysippus) Persian casualties numbered 20,000 infantry and 2,500 cavalry. The death toll would have been even greater if Alexander had followed them from the field of battle, but instead he concentrated his efforts on the Greek mercenaries who had fought with the Persian army and, regarding them as traitors, launched a furious assault against them, cutting them down where they stood. Sending 2,000 prisoners as slaves to Macedonia, Alexander also sent 300 suits of Persian armour to Athens as an offering to Athena, ordering them to be displayed with the inscription “Alexander, son of Philip, and all the Greeks except the Spartans, give these offerings taken from the foreigners who live in Asia” – all wonderful propaganda for the Greek cause. After burying the dead from both sides and sacrificing to the to the gods, Alexander visited his troops, examining the wounded and allowing each man to tell his story. His concern for them was central to his success and explains why they were to follow him to the ends of the earth. The news of his victory travelled quickly, as local towns surrendered and were garrisoned by Alexander en route to the strategic fortress of Sardis. Its Persian commander Mithrines and local dignitaries surrendered outside the city walls and, in a gesture of goodwill, Alexander gave them their freedom. He also gave orders to build a temple in honour of Zeus and left the Companion Pausanias in charge of the garrison. The news had also reached Ephesus, where the mercenaries who garrisoned the town simply fled. Three days later Alexander arrived and accepted the surrender of the city, restoring their democratic institutions and transferring all the taxes previously paid to Persia to the Temple of Artemis (the one reputed to have burned down on the night of Alexander’s birth). The towns of Magnesia and Tralles offered submission, and Alexander replaced their Persian-controlled rules with a popular local government who restored previous laws and discontinued taxes paid to Persia. Marching south through Asia Minor virtually unopposed, Alexander was welcomed as Liberator by the majority until he arrived at Miletus. Although initially accepting Alexander, news that the Persian fleet of 400 ships would come to their aid caused Hegesistratus, the garrison commander, to change his mind until all hopes of survival were dashed by the appearance of 160 Greek ships, who blockaded the harbour. Without hope, Miletus was stormed, the 300 mercenaries who had fled to a nearby island to make a last stand allowed to join the Macedonians as valuable recruits. With all the coastal towns now his, the great Persian Navy was fast becoming obsolete, and Alexander decided to disband his own smaller fleet to save funds, keeping only 20 Athenian ships to transport siege engines. In choosing to fight the Persian empire on land, it was essential to take the last remaining Persian naval stronghold at Halicarnassus, and in autumn 334 bce he marked into Caria, controlled by the Persian satrap Orontopates with help from Memnon, now promoted by Darius to head of the Persian navy. The major obstacle of the heavily fortified city was a substantial ditch 45 ft wide and 23 ft deep, which Alexander simply filled in so he could bring his siege towers, battering rams and catapults closer to the walls. Despite heavy casualties, the eastern perimeter defences began to crumble until Orontopates launched a dawn attack, setting fire to the siege towers and battering rams with buckets of pitch and flaming torches. The ensuing battle was fiercely contested until the Macedonian reserve troops forced the Persians and Greek mercenaries back inside the walls. Realising the battle was lost Memnon and his forces left Halicarnassus to its fate and sailed for the island of Kos. 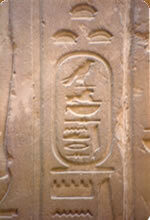 Orontopates was replaced as governor of Caria by its former queen, Ada, sister of Pixodarus. She had supported Alexander since his arrival and the instant rapport between the two monarchs resulted in Ada’s adoption of Alexander as her son. Thereafter he would always address her as “mother” and “to show her affection for him she sent him delicacies and sweetmeats every day”, according to Plutarch. With winter approaching Alexander sent all his newly married troops home to Macedonia with orders to join up again with the main army next spring at Gordium in Phrygia. In the meantime he would secure the Lydian coast and Pamphylia from any further Persian naval interest. After minor skirmishes Alexander turned his attention towards Phrygia and, after stiff resistance, Alexander installed Antigonus the One-Eyed and 1,500 men to keep his vital lines of communication open. In March 333 bce Alexander reached Gordium on the River Sangarius, where he was joined as arranged by Parmenio and the rest of the army, the newly-married Macedonians sent home the previous autumn and 3,000 rely-recruited Macedonian infantry, 500 Macedonian and Thessalian cavalry and 150 men from Elis commanded by Alcias. Whilst here, he wishes to visit the ancient palace of King Gordius and his son Midas, and see the famous cart with its complex knotted ropes which Gordius had dedicated to Zeus. Intrigued by the fable, which stated that he who could open the knot would rule Asia, Alexander spent some time assessing the situation, but with no obvious way to do this his generals were becoming worried, much to the amusement of the local dignitaries. Failure never an option, Alexander simply drew his sword and cut through the rope – “It didn’t matter how the knot was opened, only that it was!”, retorted Alexander.